PVP K 90, Talc, Aerosil 200 & Magnesium stearate. – Chlorzoxazone is a centrally acting skeletal muscle relaxant. It acts primarily at the spinal cord level and subcortical areas of the brain where it inhibits multisynaptic reflex arcs involved in producing and maintaining skeletal muscle spasm of varied etiology. This results in reduced skeletal muscle spasm, relief of pain and increased mobility of involved muscles. – Paracetamol has analgesic and antipyretic properties. It is as potent as aspirin in inhibiting prostaglandin synthesis in the CNS. 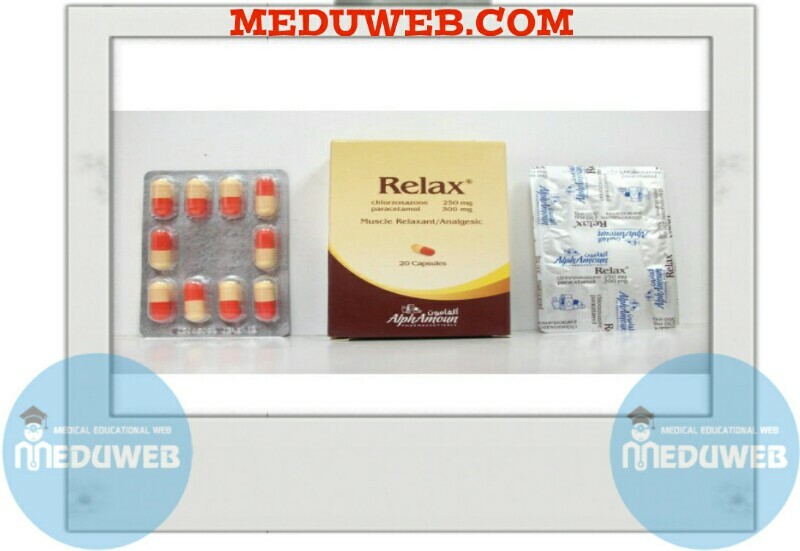 The analgesic action of paracetamol adds to that which results secondarily from muscle relaxation. even in severe painful spasms of the skeletal muscles. Rel (aspirin free) is used safely with patients allergic to aspirin, in hemophilia and upper 01 disease (e.g. ulcer, gastritis). – Chlorwxazone is rapidly absorbed and can be detected in serum within 0.5 hour. It reaches its peak blood levels, in about I to 2 hours. Its onset of action is I hour. Chlorzoxazone is rapidly metabolized and excreted in urine. primarily as a glucuronide conjugate. Its half-life is about 60 minutes. 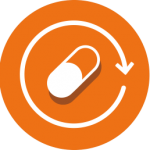 – Paracetamol is rapidly and completely absorbed from the GI tract with peak plasma concentrations within 0.5 to 2 hours. It is relatively and uniformly distributed throughout most body fluids. It is extensively metabolized and excreted in urine primarily as inactive glucuronide and sulphate conjugates. The half-llfe in plasma is about 2 hours. Relax@ capsule is indicated for the relief of severe skeletal muscle spasm associated with acute painful musculoskeletal conditions as: low back pain, cervical root and disc syndromes, sprains and strains, myalgias, torticollis, tension headaches, traumatic muscle injuries and fibrositis. N.B. Take with food or water if 01 upset occurs. • Avoid in patients with liver disease. Occasional GL disturbances, dizziness, nausea, Iightheadedness or drowsiness, malaise, or overstimulation may be noted. Rarely, a patient may note discoloration of the urine resulting from a phenolic metabolite of chlorzoxazone. Alcohol and other CNS depressants: They cause drowsiness that may be additive to that induced by chlorzoxazone, They also may increase the potential of hepatotoxicity of paracetamol. Safety of chlorzoxazone during pregnancy or lactation has not been established. Use only when clearly needed and when the potential benefits outweigh the potential hazards. concomitant use of alcohol or other central nervous system depressants may have an additive effect. – If a sensitivity reaction occurs such as: urticaria, redness, or itching of the skin, the medicine should be stopped. observed, the medicine should be discontinued. Dosages in excess of the recommended ones may cause severe liver damage. consumption without need or without medical consultation is dangerous for you. the instructions of the pharmacist sold the medicament. as they are experienced with its benefits and risks, do not interrupt or repeat the treatment course by yourself. Factory: Badr City. Cairo. Egypt.